This page details replacement of the main 6.5" door speakers in the 3rd generation Acura Integra. 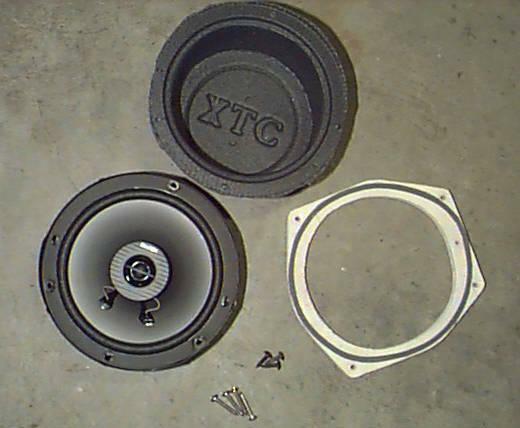 A common problem encountered with this procedure is that aftermarket replacement speakers usually require more depth than the factory speakers and therefore do not fit in the stock plastic speaker baskets. In this procedure, the stock plastic speaker baskets are replaced with custom-made adaptors cut from plywood. 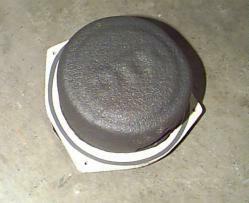 To retain the factory units' function of preventing water from dripping on the speakers, foam baffles are included. It is highly recommended that you purchase a factory service manual for your vehicle before attempting this type of work. Manuals are available from Helm Inc.. I used a pair of Boston Acoustics CX-6 speakers in my car. Their extra depth required replacement of the factory speaker baskets. Several other quality speakers are available which don't require this modification, namely the Eclipse 8263, the Pioneer TS605, and the Clarion SRR1624. A small review of these speakers is available on InsightCentral.net. Apparently the Insight suffers from the same poor-quality front speakers as the Integra, and appears to have the same size speaker baskets. Update: After 6 or 7 years, the plywood I used for this modification has literally fallen apart. Exposure to moisture over time has caused the laminations to become unglued. I plan to make some new speaker adaptors out of a different material; currently I'm considering marine plywood and plastic. Marine plywood would certainly be easier to work with, but some type of thick plastic would be much more durable and dimensionally stable. I'll keep you updated. Remove the door panels from the car doors. Disconnect the power window harness connector. Remove the 6.5" speaker assembly from the door by removing the four screws and disconnecting its wiring harness. Remove the speaker from the plastic basket by removing the three screws. Find a piece of plywood about 1/2" thick that is at least as large as both doors' speaker baskets. Place the speaker basket open-end down on the plywood and trace its outline with a pencil. Draw a second outline next to it (the adaptors will be identical in dimension). 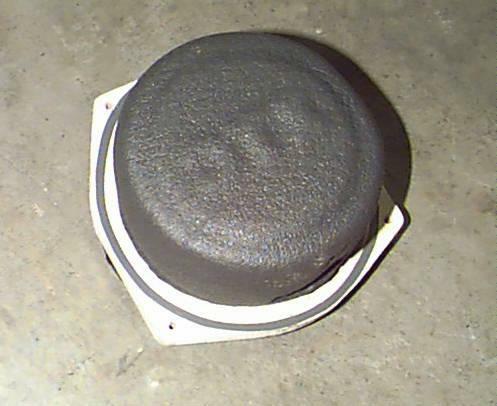 Determine from the speakers you have chosen what the manufacturer's recommended mounting hole size is. My Boston Acoustics speakers had a circle on the back of the box which could be punched out and used as a template to trace the mounting hole. Trace the mounting hole circle in the center of the previous tracing. Use a jigsaw, bandsaw, scrollsaw, or other suitable tool to cut out the adaptor. It should look like mine pictured below. If desired, spray paint the adaptor. Drill holes in the corners of the adaptor in the same locations as the plastic speaker baskets. To help seal moisture behind the vapor barrier, weatherstripping is necessary between the speaker adaptor and the door's sheet-metal. The stock speaker adaptors have this molded in, but we will have to improvise a different solution. Find some thin weatherstripping at the local hardware store. I used Frost King brand 3/8"-wide EPDM rubber weatherstripping, splitting it in half lengthwise to make it only about 5mm wide. Clean the plywood's surface, then attach the weatherstripping as shown above. To keep the speaker cones dry in lieu of the factory speaker baskets, obtain some foam baffles made for 6.5" speakers. I used XTC foam baffles from Crutchfield. Slide a baffle into an adaptor, then place the speaker inside. Trim the excess foam from around the rim of the speaker. Use the three original black screws to screw the speaker through the foam baffle into the adaptor. Cut a small hole in the bottom of the baffle below the speaker's terminals for easy access to them. 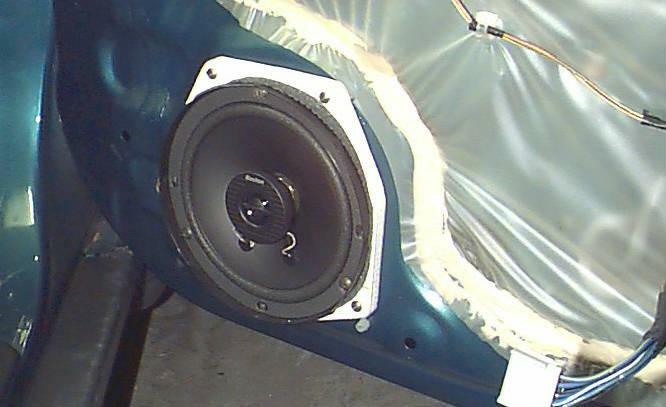 Because of the adaptor's additional thickness over the original speaker baskets, longer screws are necessary to fasten the speaker assembly to the door. Bring an original screw to the hardware store and select a stainless-steel screw that has similar diameter and thread spacing, but is about twice as long. I recommend stainless-steel for its corrosion resistance. Use four of these screws to secure the speaker assembly to the door after attaching the wires. Be careful not to overtighten the screws because they are screwing into nylon inserts in the door. It may be very difficult to replace these if they are damaged from overtightening.